As I was waiting for the ferry to take me to Vancouver Island, I snapped some photos of the fishing boats docked and bobbing in the water. The original photo challenged me to focus on the reflection and the water. 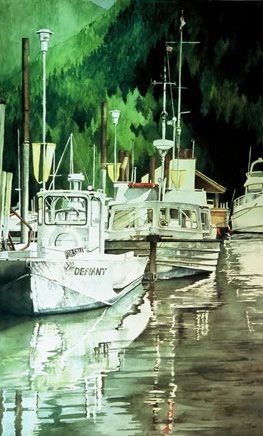 This wasone of the first images I painted in a long and continued love of marinas and boats.